Has anyone converted their tongue jack to use the same 3/4" socket drive as the scissor jacks? I am thinking of removing the handle and converting so I can use a impact driver to raise and lower along with my stabilizers. I have been thinking about doing the same .... but doubt you won't need an impact drill. It would be much quieter using a regular cordless drill. Your neighbors will thank you. On the other hand ... maybe I won't do this .... the jack handle turns easily and needing your drill is just one more thing to break and leave you to figure out how to crank up or down. On the other hand .... I have thought about welding a drive shaft in the center and leaving the handle alone ... course you'd have to put your drill on slow with that handle swinging around but you would have a back up. Why not just install a power jack? 3 bolts, one wire. Easy peezy, and no need for external equipment. Since the motor of a power jack can be in the way of tailgates and hatches, I can see the appeal of using a power tool instead... especially if the external power tool would be carried anyway, such as for the stabilizer jacks. Rather than leaving the handle in place, another way to have a manual backup to a jack converted to power-driven is just to carry a handle that works with the new drive connection... like the stock crank for the stabilizing jacks. If you use a 3/8" square socket, a power drill or impact driver will fit directly, you can use a common extension bar if you want, and a speeder handle can be the manual backup. Even with a 3/4" hex drive (like the stabilizer jacks), you would use a socket so the same speeder handle (with that socket) can be a manual backup. 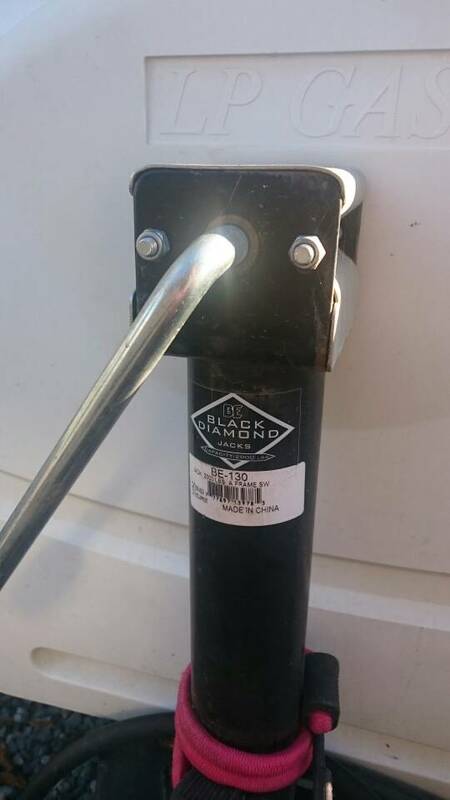 The replacement handle kit carried by eTrailer for the Bulldog brand equivalent shows that the handle is just a plain rod with a hole in it for a pin. That suggests to me that you could just use a long bolt with the same diameter, cut off the threaded part, and drill a hole for the pin (not a fun hole to drill, but do-able). The head of that bolt probably won't be a 3/4" hex (unless you're just lucky), but you could just carry a suitable socket to fit. 1. I bought I new jack when ETI put a storage box on for me last month. 2. I prefer the manual jack with the option to use the cordless driver. Great research; thanks! I am shocked that the jacks are as cheap as $27! I will once I take care of a few other more pressing maintenance items... I'll post photos then. I got the idea listening to my camping neighbours setup their 5th wheel using a cordless impact driver. I tried it out at home and it was really quick to setup that way. Figured converting the tongue jack to the same drive setup as the stabilizers would make setup that much faster!